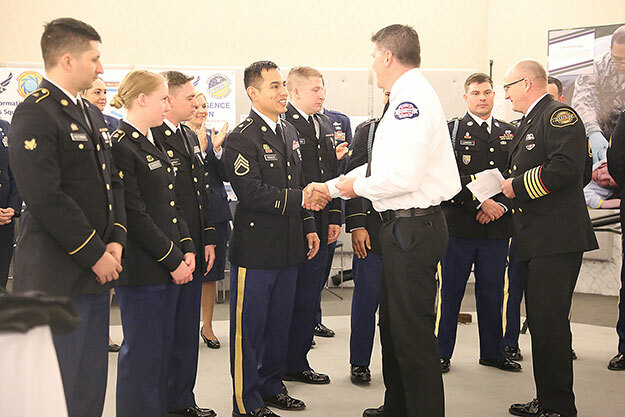 Members of the Washington National Guard were honored by leadership at Eastside Fire and Rescue for their work during the massive snow storm that buried East King County and many other areas of the state in February. The observance was part of the annual National Guard Day at the State Legislature March 27, which included visits with legislators and Gov. Jay Inslee, as well as resolutions honoring the Guard passed by both chambers of the Legislature. With four feet of snow on the ground, Eastside Fire Deputy Chief Rich Burke said that the situation was growing grim for many of their residents. The decision was made to request help from the Washington National Guard through a resource request in the state Emergency Operations Center. Guardsmen from 3rd Battalion, 161st Infantry Regiment, brought heavy equipment and supplies to fire stations in Carnation, Maple Valley and the North Bend area. Airmen from the 194th Wing also supported local crews. "We were blessed to receive the men and women of the National Guard," Burke said, flanked by more than a dozen of the soldiers and airmen in the Columbia Room at the Capitol Dome. "They arrived with high-quality vehicles, but what it really meant to our community was that the Guard had arrived, and things were going to be OK. There was a little bit of panic in our community that people were running out of food. We were running out of fuel in our stations. We were running out of medicines for people and we couldn't get to people. It was really scary times." Burke and Capt. Steven Johnson, also with Eastside Fire and Rescue, said there were many areas of their communities that firefighters were simply unable to reach because of so much snow. He described the scene when Guard soldiers responded to a call of a 70-year-old woman who had been trapped in her house since the snow started. "The way she heats her house is through firewood, and she couldn't get to her wood because there was so much snow," Burke said. The Guard showed up, made sure she was OK and reached out to her to make sure she had everything she needed, he said. "She was so overwhelmed she was in tears," he said. "It made her feel good. It made her feel safe." Burke described another incident where three soldiers helped save the life of a woman who had gone into cardiac arrest. Soldiers had responded to a welfare check, found her and got her the help she needed. "She walked out of the hospital the day before yesterday," he said. "They changed a life. Somewhere down the road, she will hopefully remember there was a whole team that responded to her call. We couldn't have sent anyone else. We didn't have anyone else." Burke and Johnson presented soldiers with a challenge coin and their heartfelt gratitude for coming to the aid when called upon. "You made a huge impact," he said. "We couldn't have done this without you. My hats off to each of you." Inslee told Guardmembers that whether it's a snow storm, a wildfire, a hijacked plane or a major disaster like the Oso landslide, "You and yours are always there. And it's just amazing to me. Every single problem we've had, you're there for us in about 12 minute's notice. I hope you'll extend our thanks to your families because they're with us, too." Inslee said he'll be pushing legislators to approve bills this year to ensure Guardmembers qualify for scholarship dollars to pay for college tuition and are paid better on the fire lines. "Seems to me everyone holding a Pulaski ought to get the same pay," Inslee said, referring to a tool firefighters use. Sen. Steve Hobbs, who is also a major in the Washington National Guard, echoed the sentiments brought by the Eastside Fire and Rescue. "When the Guard arrives, everyone knows things are going to be better," Hobbs said.